I did not build mine exactly like the one in the article but I had different needs than the author and what I could find in my junk box. The station was built on a 20-inch length of 1 by 12 inch pine board that is sanded, stained and finished. The back board is an old piece of plexiglas that I use to mount the pots, meters, LED's and connectors. I used an old PC power supply from an IBM PC Jr. That provide me with +5, -12, +12 volts. I made a battery supply that provide me with 1.5, 3, 4.5, 6, and 9 volts. I attached an outlet box to supply 120 VAC. It is located on the right side of the station. So as you can see, you could build this any way that you wanted to. Let's now talk about the "backboard" and what it has on it. 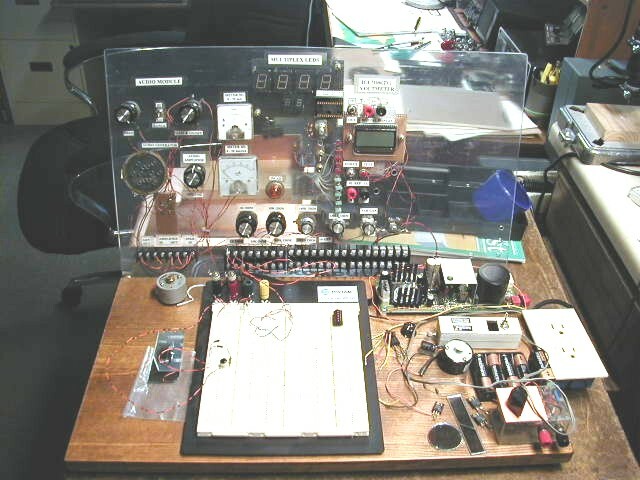 The first thing that I made, which was like the one in the article was to build a small audio amp with speaker and audio generator. They are mounted on the left hand side of the board. There is a lot of good circuits diagrams out there to build your own. I also built a digital volt meter using a ICL7106, this gives me a range from 0 to 2 volts. It is located on the right hand side. The other thing that I placed on the back board was two meters, one from 0 to 10 ma and one from 0 to 50 micro amp. I put in a range of control pots with the following values 1K, 10K, 100K and 1Meg ohm at the bottom of the board. There is also LED's for different circuit requirements. If you look at the row of LED's (red and green) that is used as a bar graph. I also have room to build more on the right side as my needs change. Everything is connected to the back board by the terminal connectors located at the bottom. I have labeled them so it is easy to recognize where the wires go. As you can see from the pictures of the terminals, I do have wires connected to them from a previous circuit.